This material has been transcribed from photocopied material in publications referring to the origins of the Allardice Family and describing the Allardice Castle. Alternate spellings of the name appear to be used interchangeably by the authors throughout, when referring to the family and the castle, particularly Allardice/Allardyce. Because of the quality of the copies, some licence has been assumed in transcribing, to interpret the wording or ‘fill’ missing words. In addition, fine print footnotes and cross references cited in some texts have had to be omitted as they are illegible in the photocopies. The documents are listed in approximate chronological order. "Memorials of Angus and the Mearns"
to Edward the First of England in 1271 – 1296. Allardices of Allardice – Sir John married Lady Mary Graham – Catherine Allardice Excommunicated for Quakerism – Barclay of Ury Married to the Heiress of Allardice – Early Notices of the Barclays of Angus and the Mearns – The Kairn, or Castle of Mathers – Inscription from the Tombstone of "the Apologist for the Quakers" – The Allardices of Angus, etc – Allardice Castle. NISBET says that King William the Lion gave charters of the lands of Alrethes, or Allardice, in the Mearns, to a person who afterwards assumed that name. It is variously spelled, and provincially pronounced Airdis, particularly by old people. who took the oath in March following. The first had probably been chief of the Mearns branch, and the latter may have been a near relative, for, towards the middle of the subsequent century, the names of Walter and John of Allardice appear as witnesses in several local charters and other deeds. In 1369, Thomas of Allardice had an annual of 20s. out of Little Barras, ajoining the parish of Kinneff; and from a portion of these lands being called the Sister Riggs, tradition says that the estate was divided among three co-heiresses, one of whom was married to an Allardice. In the year 1492, John of Allardice was a witness regarding portions of the lands of Glenbervie and Barras, which belonged to Sir John of Auchenleck; and in 1512, Robert Allardice had a charter from John, his father, on the half lands of Little Barras, to himself and his heirs. 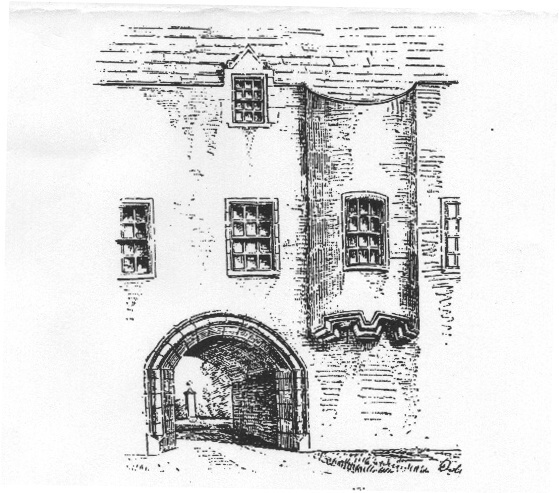 The laird of Allardice was a representative in the memorable Parliament held in Edinburgh, on the 1st August 1560,, by which the Papal jurisdiction was abolished in Scotland; and near the close of that century, John of Allardice was upon an inquest regarding the lands of Balfeith, and the Mill of Conveth or Laurencekirk. This laird appears to have married a daughter of Robert of Arbuthnott; and their grandson married Beatrice, daughter of the fourth Earl Marischal, by whom he acquired the lands of Powburn. Probably this laird’s mother, who was one of the Gordons of Methlic, had also brought landed property to the family, since in 1543, John of Allardice granted a bond of manrent to the Earl of Huntly, by which he bound himself "kyn, frendis, seruandis, tenantis, and adherentis, to gang and ryid with his lordschip in oistingis and uder besines in peace and weyr," in preference to any other person, the Queen and her governors only excepted. John of Allardice, probably the son of the last named, was succeeded by his son James, in 1642. A son of the latter became Sir John, being the first of the family who appears to have been knighted; and it was (as is presumed) Sir John’s sister, Catherine, who was married to John Fullerton of Kinnaber. As before seen, this lady and her husband were so strongly in favour of the then recently introduced and unostentatious principles of the Quakers, that the Presbytery of Brechin, after a vast deal of communing among themselves, and private conferences with the accused, finding that all hope of gaining them back to their church was gone, formally pronounced the bann of excommunication against them, and a domestic servant, "for adhering" in the intolerant words of the record, "to the scandalous errours of Quaquarism." Probably a community of religious feeling between the Barclays and the Allardices may have had something to do in bringing about the close connection which ultimately subsisted between these families. Sir John Allardice married, in 1662, Lady Mary Graham, daughter of Lord Kinpont, grand-daughter of William, Earl of Airth and Menteith. This Lady, who died in 1720, was buried in the family vault at the kirk of Arbuthnott, and left four daughters and two sons; the eldest son died without issue, and the second, George Allardice was sometime M.P. for the borough of Kintore, Master of the Mint, and a zealous supporter of the Union. He died in 1709, leaving by his wife, Lady Anne Ogilvy, eldest daughter of the Earl of Findlater and Seaforth, a large family of sons and daughters; and in their grand-son, James, the male issue failed. His only child, Sarah-Anne Allardice, who died in 1833, having married Robert Barclay of Ury, had three sons and five daughters, and the eldest son, Captain Robert Barclay-Allardice, the celebrated pedestrian, succeeded to the estates of Ury and Allardice. He died 1st May 1854. The additional patronymic of Allardice was assumed by Robert Barclay of Ury, in consequence of his marriage with the heiress of the estate; and in virtue of the marriage of Sir John Allardice and Lady Mary Graham, the late Captain Barclay-Allardice claimed to be the representative of the Earls of Airth and Menteith, and the seventeenth in lineal succession from Robert II, King of Scotland. Besides the old patrimonial estate of Allardice, which lies in the parish of Arbuthnott, and other lands in the Mearns, there were Allardices designed of Inverquharity (about 3 miles north of Kirriemuir), in Angus, during the time of Robert III, and of Duninald, towards the middle of the seventeenth century. Near the end of the fifteenth century, there was a churchman called James Allardice, who sat in Parliament, under the designation of the Provost of the Kirk of the Virgin Mary of St Andrews; and about the same period, William and John Allardice were pastors respectively of the kirks of Dunbog and Fife, and of Coull in Aberdeenshire. The castle of Allardice is a baronial building of moderate pretensions, picturesquely situated on the north bank of the Bervie water, about a mile above the bridge of Inverbervie, from which, perhaps, it is seen to the best advantage. It appears to have been mostly built about the time of the marriage of Sir John Allardice with Lady Mary Graham ; and, having been deserted by the family soon after the estates fell to the Barclays, it was occupied towards the beginning of this century by a wood forester. Latterly it became uninhabitable and almost a ruin, but having been repaired within the last twenty years, it is now the residence of the farmer. Note: This text cites many cross references in footnotes to document the statements. Unfortunately the photocopy available was not clear enough to be confident to transcribe this information, and anyone doing serious research should consult the original. "The Castellated and Domestic Architecture of Scotland II"
This building is remarkable on account of the extraordinary development of label mouldings in the corbelling. This is a very favourite form of ornament in the north of Scotland, but it has here (Fig.844) been applied in a more prolific manner than usual, and, it must be admitted, with very picturesque effect. This castle presents a characteristic example of that style of work. The ornamentation of the corbels carrying the projecting staircase of the east front is also very remarkable (Fig. 843). Figure 843 – Allardyce Castle. Entrance Archway. The building has been so much altered and modernised that the original plan is no longer recognisable. The entrance archway (Fig. 843) to the courtyard, however, still remains, with a bold bead and splay on the outside. The pillars in the inner court seem to have formed the entrance to the garden beyond, down a flight of wide steps. The castle was formerly the property of the Allardyces of that Ilk, a very old Forfarshire family. Sir John, the first Knight, probably built the castle about the beginning of the seventeenth century. It is situated above the eastern steep bank of the Bervie Water, about two miles up from Bervie. Figure 844 – Allardyce Castle. Interior of Courtyard. Inverbervie, Kincardineshire, 20 miles south of Aberdeen on A92. Standing on the north bank of Bervie Water and about one mile above Inverbervie’s Jubilee Bridge is Allardyce Castle. It is thought that it was built around 1662, the time of the marriage of Lady Mary Graham to Sir John Allardyce. The multi-turreted stair tower at the castle is a particularly fine example of the peculiarly Scottish art of label-corbelling, which can best be described as both ornamental and functional, consisting of stone brackets which support projecting battlements or turrets. "The Fortified House in Scotland"
Set picturesquely on a terrace in a bend of the deep valley of the Bervie Water, about two miles west of Inverbervie, Allardyce is an interesting and attractive mansion of probably the late 16th century, now occupied as a farmhouse. Although giving the impression of all belonging to one period, the two wings of its original L-plan have in fact been extended, that to the west very considerably, about a century later. The building has formed two sides of a courtyard, the remainder of which has been enclosed by a curtain-wall, and access thereto gained by an attractive pend, slapped through the basement of the main block – a fairly unusual arrangement. Also highly unusual is the amount and intricacy of the label corbelling supporting the stair-turret which rises in the re-entrant angle. This is corbelled out at the top to form a gabled watch-chamber reached by a secondary turret stair and flanked by a slender angle-turret, the entire composition being most pleasing. Other notable features are the offsetting of the walling to the west, and the tall chimney-stack rising above this front. In the main the walls rise to four storeys and an attic, and are rough cast and whitewashed. The basement is vaulted and the usual arrangement of kitchen premises below, Hall on first floor, and sleeping accommodation above, would apply. A stone built into part of the extension is dated 1695. The name Allardyce has had more than the usual variations in spelling. We read that Alesaundre de Abberdash and Walterus de Allerdas signed the notorious Ragman Roll of English Edward the First at the end of the 13th century. Shortly afterwards Robert Bruce gave a charter of the property under the name of Alrethes to one Duncan Judicii. This Duncan and his descendants adopted the name of Allardyce of that Ilk for themselves, and retained possession for many centuries. In 1656 however, spelling difficulties were still cropping up, for Cromwell, nominating justices for the county of Kincardine, included one Thomas Ardes, Tutor of the same. In 1662, Sir John Allardyce married Lady Mary Graham, grand-daughter of the unfortunate Earl of Airth. At the turn of the 18th century, however, the Allardyce heiress carried the property to her husband, Barclay of Urie in the same county. The famous pedestrian, Captain Barclay-Allardyce, was notable for his long distance walking. He died in 1854, and with him it seems the long line of Allardyce of Allardyce became extinct. Fiddes is roughly L-shaped, with the wide main stair tower running right round one corner of the ‘L’ into the entrant angle, almost masking its true shape. The lower floors are barrel-vaulted and there are at least three other staircases, one straight up in the thickness of the wall from cellar to hall, the laird’s private way to his wine. The oldest part of the castle dates from the sixteenth century and was probably begun by Andrew Arbuthnot, who received a charter from the infant Mary, Queen of Scots in 1553. The Arbuthnots are amongst the best known families in this part of the world. Arbuthnot House by the Bervie Water is their present seat. Between that pleasant manor house and the sea is Allardyce Castle, ancestral home of yet another old east coast family. Really a fortified manor, like Muchalls, the castle has been enlarged and altered since the early seventeenth century, when it was built as a simple laird’s tower. Today that tower still stands up white and attractive near the river, like a small château. It has no shot holes, while Fiddes has them all over the place and especially high up, and apart from a fantastically gay little cluster of turrets and what is known as label corbelling (that is: mainly horizontal corbelling, broken here and there with indentations and reminiscent of the drip hood of a mullioned window), it is simply a modest country house. Note: These plans are of Fiddes castle, also in the Mearns which appears to have some similarities to Allardice castle, and illustrates some features described in other articles. "The Castles of Grampian and Angus"
This building on a promontory above the winding Bervie Water has been restored since It was purchased in 1969. It was built c.1580 - 1600 by the Allardyce family, the male line of which ended in the late 18th century. The heiress married Barclay of Urie. Captain Barclay-Allardyce, who died in 1854, was the last of their descendants. The building is an L-plan with one wing having an entrance passage with a roll moulded pend arch leading into a former courtyard. There are two storeys, one partly in the---- over vaulted cellars. Towards the approach is a shallow round projection carried by label moulding, whilst similar mouldings carry a stair over the re-entrant angle stair surmounted by a caphouse reached by a conical-roofed stair turret. Note: Dashes and italic ‘guesses’ at the start of each line result from truncation of the text in the photocopy available. Front and rear photographs of the castle are included but are not of suitable quality to reproduce from the photocopy, particularly when compared with the ones on Allerdice.net. However, they suggest that the book is probably some decades old, as there is no rehabilitation of the gardens and no smoke stains from the fire. Two miles west of Inverbervie, in a valley of the Bervie Water, Allardyce Castle is a late-sixteenth-century mansion, later a farmhouse. Both arms of its L-plan were extended a century or so after the original structure was built. It was much altered in the following century, but is remarkable for the use of label mouldings in the corbelling, a device much favoured in the north east, and here probably unique in the intricacy of its application to support the stair turret in the re-entrant angle. The main block rises to three storeys and an attic. The castle once formed two sides of a courtyard, the remainder being enclosed by a barmkin. Access to the courtyard was through a still surviving pend in the main block. A few years ago the castle suffered severe fire damage, but has now been successfully restored, and is the home of an architect. The ancestors of Allardyce of that Ilk, variously spelt, had their land from Robert the Bruce. An heiress carried them by marriage to the Barclays at the turn of the eighteenth century. The last of the Allardyces of Allardyce was Captain Barclay-Allardice, a famous walker who died in 1854. If you have other documentary information of interest to other Allardices, forward it as an e-mail attachment to the web site for possible addition to this file.